(WNN) The BN-800 fast neutron reactor,Unit 4 of the Beloyarsk nuclear power plant in Russia, has started commercial operation, state nuclear corporation Rosatom announced this week. (Wikipedia) The plant is a pool-type reactor, in which the reactor, coolant pumps, intermediate heat exchangers and associated piping are all located in a common liquid sodium pool. 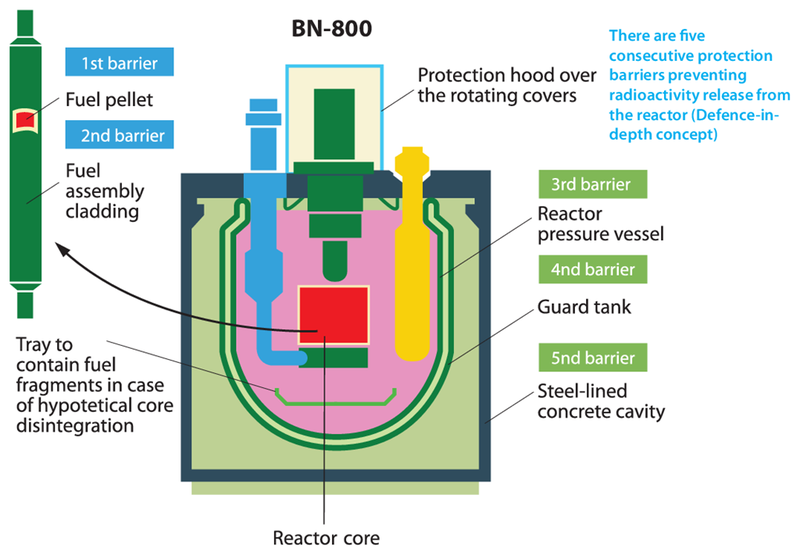 The reactor core is, in size and mechanical properties, very similar to the BN-600 reactor core, but the fuel composition is very different. While BN-600 uses medium-enriched uranium dioxide, the new plant will burn mixed uranium-plutonium fuel, helping to reduce the weapon-grade plutonium stockpile and provide information about the functioning of the closed uranium-plutonium fuel cycle. The closed cycle will not require plutonium separation or other chemical processing. The unit employs a three-circuit coolant arrangement; sodium coolant circulates in both the primary and secondary circuits. Water and steam flow in the third circuit. This heat is transferred from the reactor core via several independent circulation loops. See video below. (WNN) Lightbridge Corporation and Areva NP announced they have agreed key terms for the creation of a 50-50 joint venture to develop, manufacture and commercialize fuel assemblies based on Lightbridge’s “next generation” metallic nuclear fuel technology. The two companies announced today they have signed a term sheet outlining key agreements for a US-based joint venture covering fuel assemblies for most types of light water reactors, including pressurized water reactors, boiling water reactors, small modular reactors and research reactors. Lightbridge’s advanced metallic fuel is made from a zirconium-uranium alloy and uses a unique composition and fuel rod geometry, which, the company says, enables it to operate at a higher power density than uranium oxide fuels in use today. In January, Lightbridge received final regulatory approval for irradiation testing of its metallic fuel at Norway’s Halden research reactor, which is expected to begin in 2017. (NucNet)(Reuters) Six companies have shown interest in building additional nuclear reactors at existing power station sites in the Czech Republic, but a decision to proceed with construction will probably come after elections in October 2017. Jan Stuller, the Czech government’s special envoy for nuclear power, said that Russia’s Rosatom, French group EDF, US company Westinghouse, Korea Hydro & Nuclear Power, China General Nuclear Power and a grouping of France’s Areva and Mitsubishi Atmea had all shown interest in future construction. The Czech Republic’s National Action Plan for the Development of Nuclear Energy counts on at least one new reactor being built at the Dukovany and Temelín nuclear sites, with a probable total of four new reactors in the long term at the two locations. Priority for construction of the first reactor will be given to the Dukovany site, where the first of four reactors operating there will probably be shut down in 2035. The Czech Republic has six commercially operational reactor units: four VVER-440 units at the Dukovany site and two VVER-1000 units at Temelín. Thge Czech government owned nuclear electric utility CEZ has driven potential bidders crazy in recent years with a series of on-again/off-again announcements about a nuclear tender. At one time it was considering up to five new reactors worth an estimate $25 billion. It cancelled that tender, and a subsequent one which involved CEZ disqualifying Areva for unstated reasons. The main issue is whether the Czech government will make promises to hold rates at sustainable levels. So far the jury is out whether it can or will make this commitment. Also, the country’s anti-nuclear neighbor to the north, Austria, has pledged to make trouble with the European Union over what it perceives as “subsidies” if there are rate guarantees for the new reactors. On the demand side, CEZ would love to sell all that CO2 free nuclear power to Germany which closed half its nuclear fleet and doubled the price of electricity to consumers. Germany also significantly increased burning cheap coal – lignite – in its fossil power plants making a mockery of its commitments to address global warming. (NucNet) There is no environmental impact that precludes issuing combined construction and operating licences (COLs) to Florida Power & Light for two additional units at its Turkey Point site about 25kms south of Miami in Florida. The NRC and the US Army Corps of Engineers developed a final environmental impact statementointly. FPL is proposing to build two AP1000 units, Turkey Point-6 and -7, at the site of two existing reactors. The Atomic Safety and Licensing Board is conducting a legal hearing on a challenge to the application. When the technical review is completed, the NRC’s commissioners will conduct a separate mandatory hearing regarding the application and the staff’s review. All of these steps must be completed before the NRC can reach a final decision on the Turkey Point application, the NRC said. FPL submitted a COL application in June 2009. The NRC certified the AP1000 design for US use in December 2011. (Business Standard)(Press Trust of India) India and Japan are likely to sign a civil nuclear cooperation agreement during Prime Minister Narendra Modi’s two-day visit to that country next week as the two sides completed the internal procedures for the much- awaited agreement. The two countries had sealed a broad agreement for cooperation in civil nuclear energy during Japanese Prime Minister Shiozo Abe’s visit here last December but the final deal was yet to be signed as certain technical and legal issues were to be thrashed out. There was political resistance in Japan to go ahead with a nuclear deal with India, particularly after the disaster at the Fukushima Nuclear Power Plant in 2011. Japan is a major player in the nuclear energy market and an atomic deal with it will also make it easier for US-based nuclear plant makers Westinghouse Electric Corporation and GE Energy Inc to set up atomic plants in India as both these conglomerates have Japanese investments. Japanese members of the Diet, the countgry’s parliament, have resisted commercial nuclear ties with India because it has not signed the nuclear nonproliferation treaty. Even if the agreement goes through, India may add a new condition to having Japanese firms do business there. It will ask for Japan’s support to become a member of the Nuclear Suppliers Group, which controls global markets for commercial nuclear reactor fuel. India has been holding U.S. firms hostage to this request by passing a so-called Nuclear Supplier Liability Law. The law also benefits the country’s massive coal interests who have no desire to see coal fired power plants swapped out for nuclear reactors.